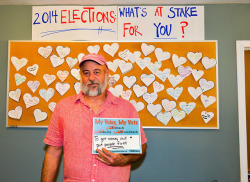 “More is at stake for our children’s future this November 4th than ever before. Our families are being attacked by mass incarceration, deportation, voter suppression and severe cuts to public education. But together, we can determine the outcome of this election and build a better Kansas. That’s why everyone is volunteering and getting their family members, friends, and even distant relatives to turnout on Tuesday, November 4th.” – Reuben Eckels, Deputy Director of Kansas People’s Action.